Safety doesn't have to be boring. Making the slopes safer can be a lot of fun! or Word, 775 KB Letter to ski areas. 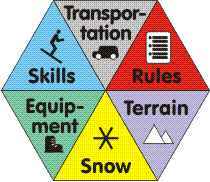 The 6 facets of safety (condensed). For full version, click on hexagon below. conditions that put you at risk. precautions, More trees at ski areas. What we've learned by trying it. How to encourage controlled turns. spreads awareness & gets tough. Lower the bar. Stay safe. Injuries from plastic bags on the slopes. * The Meta-Study on CMAJ web site. 1. Common sense (1 min.) - Just don't do stupid things, like these people, OK?! 2. Know your gear (3.5 min) Can you spot all the things this bear is doing wrong? 3. Loose clothing & equipment (1.2 min) Yes, these things DO happen! 4. Respect Nature (1.3 min) Nature is bigger than you. 5. Avoid Jumps (1 min) Warning: graphic & distressing audio!!! This is real! The guy survived, healed, and did it again! See "Common sense" above! 6. Avoid Pranks (5.6 min) - You have to see this to believe it! 7. Keep a Vertical Distance (1.5 min.) - Avoid collisions. 8. Tree-well rescue. (7 min.). Man ends up head-first in tree well. 9. Tree-well Dangers (13 min.). Compilation of 3 accidents, of which 2 were survived. One of them shows it from the point of view of the person buried in the tree well. It's hard to watch, but the person survives the 1-hour long ordeal. 10. Tree Wells - a compilation. Tree safety advice from the Mt. Baker ski patrol, Crystal Mt. ski patrol, Mt. Bachelor ski patrol, and L.E.A.D. USA LLC. A good summary of what you need to know about the dangers of tree wells and how to avoid them. Safety Boundary Signs - Safety signs west of Timberline, including article, pictures, and maps. 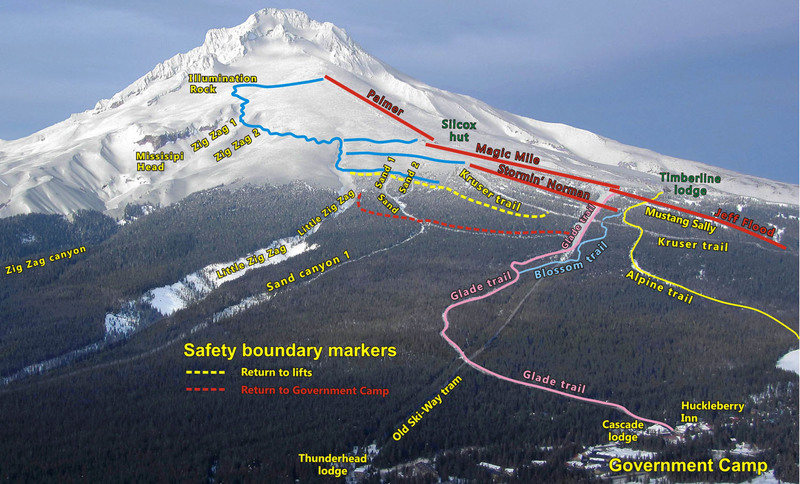 Safety Boundary map - South side of Mt. Hood. 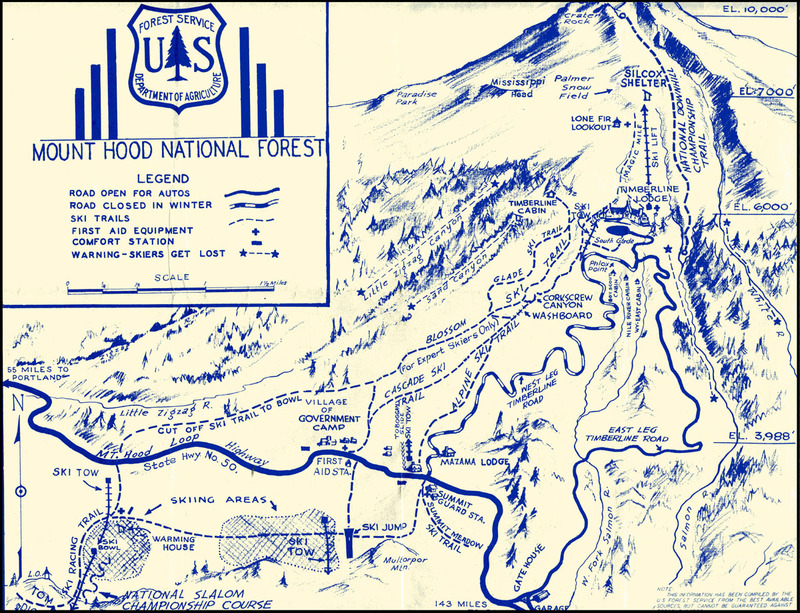 1941 Forest Service map of Mt. Hood's south side. See more on Safety on our Articles page.